It’s hard to imagine what lies behind this discreet facade in Rue Saint Martin. Two Haussmann buildings reunited around an inner courtyard, like a lung and cascade of light on the intoxicating fresco by the painter Gaël Davrinche, the Hôtel National des Arts et Métiers is on the list of those haute-couture places with particularly unforgettable luxuriously timeless charm that is particularly unforgettable. 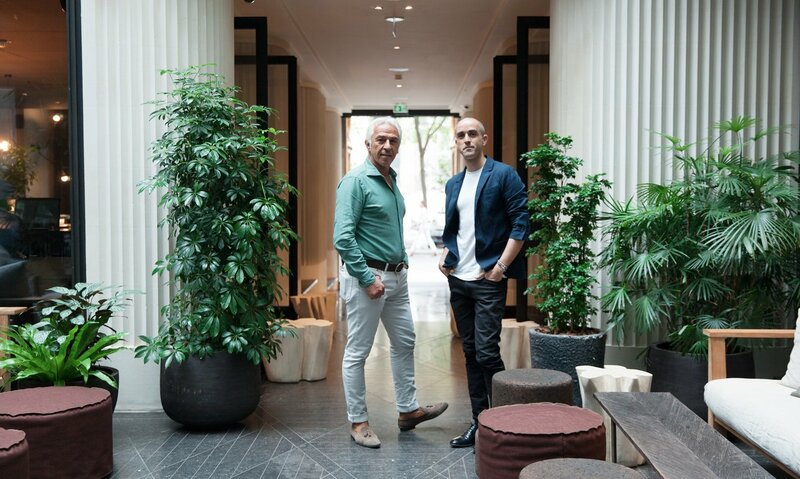 When Samy Marciano, the owner of the hotel met Raphaël Navot, one of his favourite designers, it was to discuss a bold gargantuan project where everything seemed possible. Being undeterred by dreams of any kind, Raphaël and Samy take great delight in combining materials and forms. Right from the entrance, the tone is set by cut-stone pillars with delicately fluted, hand-carved designs, or the tubular metal cascade in oxidised copper – subtle hints borrowed from the Parisian world outside. Granite floor, satin concrete in the bedrooms, wild ferns and even scorched wood, so many elegant details that resonate like an ode to raw material and craftsmanship. 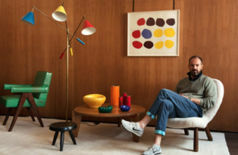 Raphaël Navot’s design process is intense. The writing of a manifesto, drawings, the search for craftsmanship in everything that is most timeless: here, the man presents us with breathtaking features including a marble staircase, an organic UFO full of curves and deliciously smooth to touch. This feast for the eyes is enhanced by a symphony of flavours and aromas where Italian cuisine is the star attraction. 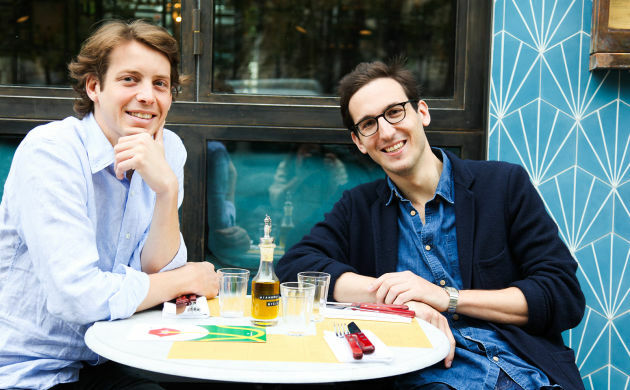 With the Cicchetteria and its Venetian-style tapas, the immaculate menu of the Ristorante National – designed by Julien Cohen, Jean-Pierre Lopes and Thomas Delafon – has what it takes to delight the palates of the keenest foodies. 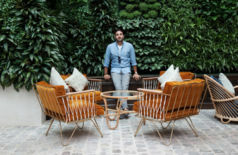 And for lovers of spirits, the Herbarium bar is an invitation to awaken the senses, offering cocktails designed like fragrances by the mixologist Oscar Quagliarini. A welcoming and timeless place, the Hôtel National des Arts et Métiers will without doubt become a compulsory stopping-off place in any Parisian wanderings. Raphael, Samy: can you tell us a bit about yourselves? I was born and raised in Jerusalem, traveled to the Netherland to study at the Design Academy Eindhoven by Li Edelkoort and moved to Paris following artist Catharina Van Eetvelde. Since my arrival to Paris in 2004 I have been experimenting with various crafts through a chain of opportunities that led me quickly to interior architecture. Nowadays my work is dedicated to craft. It is present in the every projects I work on -whether costume made furniture, materials or textures. I work independently while collaborating with architects, designers, artists, or landscapers. This allows a flexible structure that can change from project to project as well as a reasonable amount of freedom to select the right projects. After arriving in France from Tel Aviv in the 80s, I had a career in manufacturing and distributing ready-to-wear clothing. After 30 years in fashion, I had the opportunity to invest in the hotel industry in London, where I was lucky enough to work with designers including Anoushka Hempel and Ron Arad. After working with them, I took the plunge with the construction of my first hotel in Paris, Hôtel Bachaumont, which opened in July 2015. 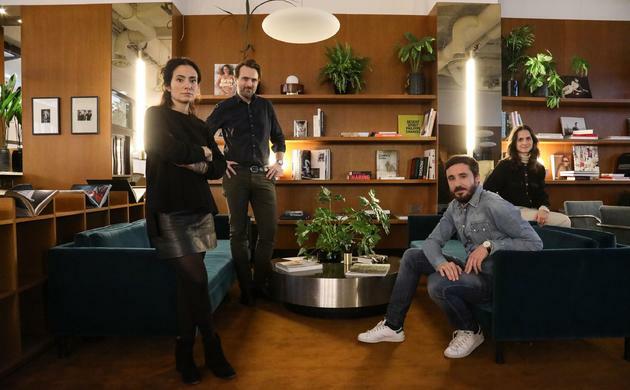 Two years later, the latest property of the Clé Group, Hôtel National des Arts et Métiers opened its doors. What did you expect and want this project to be like? 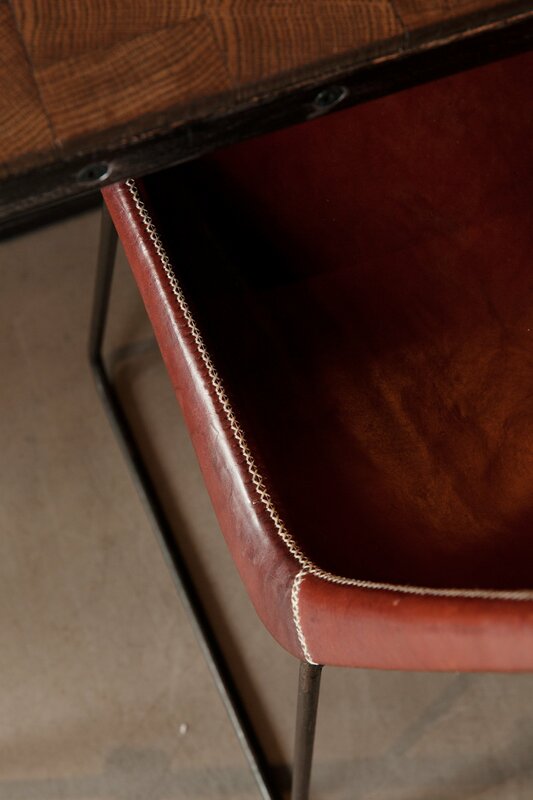 I wanted to create an innovative and timeless place, different to other addresses in Paris. Why did you choose to work with Raphael and how did you meet him? During a dinner, I noticed a light fitting designed by Raphael. I then met him and we started working together. Hôtel National des Arts et Métiers is the 4th project which we’ve worked on together. Working in perfect harmony ever since our first project, there was no-one I felt more comfortable working with as part of this new adventure. Raphael, how do you think the whole identity of the Hôtel National des Arts et Métiers? I usually create some sort of values-definition or general-direction before starting to draw. It helps me and the team to have a grounded starting point and a goal to follow. I believe that setting intentions is an essential ingredient in my process which gives both the team and the owner tools to asses the design that follows. For this project, my starting point was the unique location – Arts & Métiers, so inevitably I embarked in a research about numerous Parisien crafts. In order not to fall into a traditional expression (despite using traditional crafts) I wrote a light manifesto titled The Natural Future which in its essence talks about natural materials and their graceful ageing, unprocessed rough minerals and woodwork, yet at the same time about timeless expression that is not directly linked to an era or timed style. I believe in places that stay, less in the trendy buzz. Much of the initial work was made within a collective of different professionals. The secret recipe for a good project lies in the quality of the team. One of Samy’s great qualities is to find the right people in their right momentum and to motivated them with great solidarity into one project. I had a most incredible chance to work with the Cohen’s: Marie-France, Julien and Stephanie who each of them represent different qualitative and sensible life-style venus around Paris (Merci, Grazie, Démodé, ect.). Having them both as clients and collaborators boosted my designs and enriched the creative exchange. Much of the accomplishments for this space I share with them. Can you tell us more about the work you have done with the fabrics, the craft technics? There are many different techniques used throughout the project, I hope somehow it is felt once experienced. The works has been achieved thanks to DVVD architects and engineers, that took on both structural and operational aspects as well as the meticulous engineering (Jules Verne spirited) of the skylight that opens in a very cinematographic manner, creating an outdoor courtyard in the heart of the hotel. Together with AGB as the contractors, we searched and found the various experts, either by trial and error or by sheer chance. Now, let’s do a focus on the materials I use. First, Pierre de Taille. One of the most remarkable crafts is found in the entrance – the paris stone pillars. The wide pillars that make the entrance hall of the hotel are carved by hand with massive Paris stone. Paris is worldly known for the high quality of its ‘Pierre de taille’ architecture, mostly the traditional Haussmanien buildings. Despite the high preservation of its facades, there are less and less companies that hold the knowledge of hand carving. The group that orchestrated all the artisans, AGB found an incredible group of artists called Patrimoine Pierre de Taille who built and carved the plissé structure of these pillars on site for a period of 8 months.They brought such a meditative respectful quality to the construction that inspired us to continue in this path. 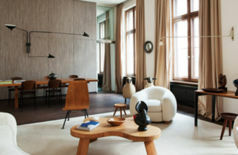 Aside from these traditional techniques, there are many materials that have been developed for the space such as the oxidized copper tubes wall. The bright green/blue color of oxidation is rather common in the streets of paris, it covers the bronze sculptures and some of the pillars and rooftops. 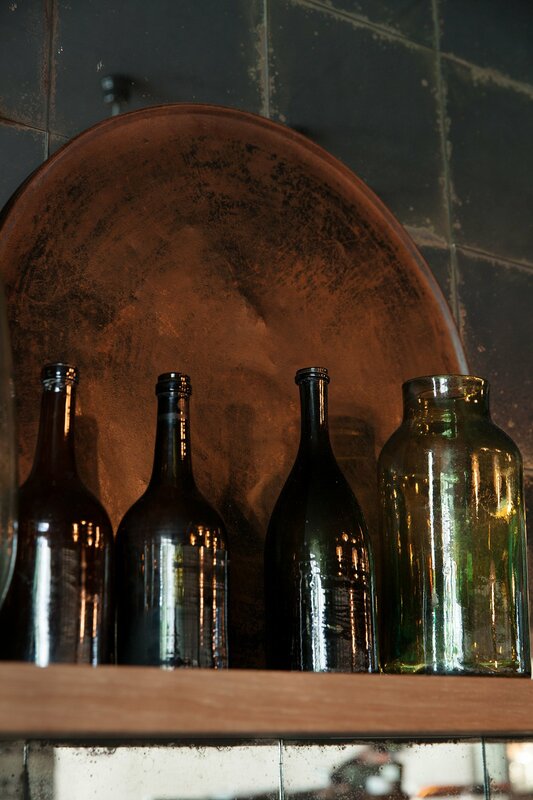 The uneven nature of oxidation is made by either a recipe of vinegar salts and acids or by time itself. The works have been realised by metal Artist Ronan Masson. Throughout the hotel you will find hundreds of meters of organic corridors, ‘science-fiction’ like underground curves, classical molding (Moulure) and other subtly sculpted forms, all made with plaster, which is a soft mix of sand and concrete. The works are made with the french company Staff Décoratif. Another great french company is LCDA, who master concrete walls. We have made with them massive concrete panels for each of the 66 rooms in order to give the protected, urban yet elegant vibe only real concrete can give. We went through numerous amount of companies who specializes in concrete imitation and substitues yet came back again and again to the original material. Also, I worked closely with Pierre Gouazé of the Paris based company Signature Murale, with whom I developed some wild new textures with their natural wall covering minerals. for example – we’ve made 4 different wild fern stamp to cover the forest-like walls of the Herbarium cocktail bar. End grain wood is simply the direction in which the wood is cut and worked. I have been passionate about this method for a while now and collaborated with a prestigious company Oscar Ono for developing a line of end-grain flooring and wall covering. bringing back old tradition to a contemporary use. we have used in the hotel’s lobby the floor I developed with them for AD Intérieurs in 2016. Around the hotel you will find many other materials made by other artisans such as burnt wood and leather, self illuminating glass, aged mirrors, Verona’s Terrazzo, metal rock, rough wooden trunks ect. For this project you have work with plenty artist, who are they? For the hotel, I worked closely with Antwerp based designer Pieter Maes with whom I brainstorm and visualise the different spaces. He is an old friend and collaborator with whom I worked for many projects before. We put up all the spaces in 3d format and detail all the custom made furniture. I had the pleasure of meeting Gael Davrinche, who is a Paris based painter. I was introduced to him by Marie-France and Stephanie Cohen. 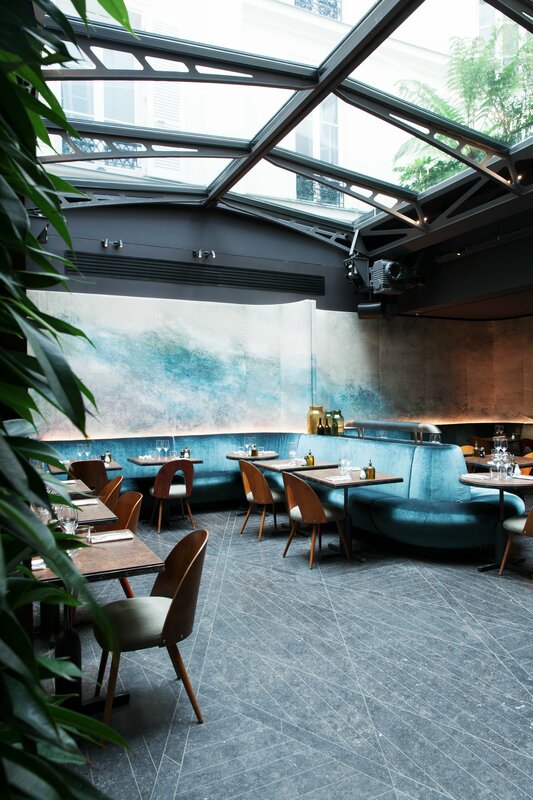 His soothing panoramic painting, Japanese ink on wild linen (rue Hérold) wraps up the space under the skylight and into the restaurent bar. Another different type of artist is Kali Vermes, a gentle yet vigorous landscaper with a talent that can combine the elegant and the savage (beauty and beast). We have established a brief for the space, exchanged some ideas and took a very green vibe into the entire hotel and roof top. The presence of nature was inevitable for the space as it is flooded with light and natural materials. Aside from the physical aspects, I worked with parfumer Arthur Dupuy, with whom we created the brand Racine for the hotel’s scent, which you can find in the cosmetics of the rooms, the lobby and corridor perfume and gift candles at the welcome desk. Can you tell us more about the sound and the light athmosphere? We had consultants for both aspects. 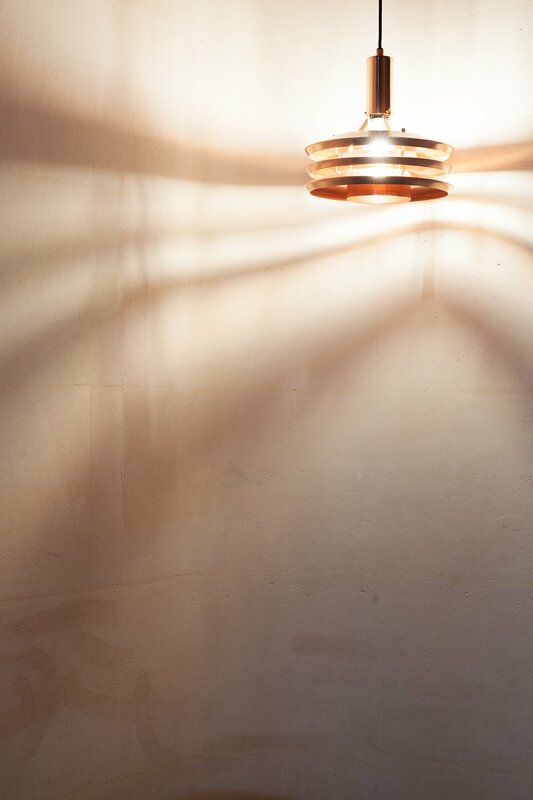 Florian Douet joined us as light consultant and brought the soft and sophisticated touch. As for acoustics, we were challenged by the fossil granit floor, the skylight glass and metal works- all reflective materials which makes the sound resonate. in order to create a pleasant phonic ambience we worked with Kvadrat for all the ceiling of the different spaces as well as using the painting of Gael Davrinche as a high performant acoustic wall. On top of that, the velvet benches (realised by Moroso), the end grain wood and vegetation added a great advantage for absorbing sound. Samy, can you tell us a bit more about the restaurant and the cicchetteria, both focused on Italian cuisine? 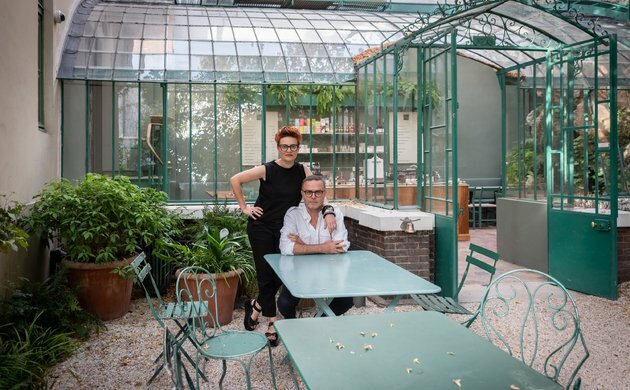 For the catering at Hôtel National des Arts & Métiers, the Clé Group has called on the expertise of three key players when it comes to Parisian restaurants: Julien Cohen (Pizza Chic, Grazie, Il Professore) and the duo of Jean-Pierre Lopes and Thomas Delafon (Le Très Honoré, Bambou, la Plage Parisienne). While Julien Cohen sets the tone with his indisputable knowledge of Italian cuisine, together the trio are able to offer different catering options within the hotel, independent locations where good products are enhanced by talented chefs and barmen and served elegantly and delicately by waiting staff. All the facilities are open 7 days a week, consisting of le Ristorante National: under the retractable canopy of the hotel’s patio and with a stylish trattoria feel, it can accommodate up to 80 guests. For this restaurant, open to outside clients, the trio has created authentic Italian cuisine, using traditional recipes and enhanced by exceptional products sourced directly on the peninsula. Bathed in daylight, le Ristorante National focuses on the conviviality of its culinary menu, combined with meticulous yet relaxed service. An elegant table, designed for sharing and for those who love food. La Cicchetteria National: upon arrival at the hotel, the guest is received here. As the name implies, this place offers a wide range of cicchetti. These Italian tapas are to be eaten as an aperitif but can also be a light meal or shared among friends. Of course, you can enjoy a coffee – in all its wide-ranging varieties – or a glass of wine or a Spritz. 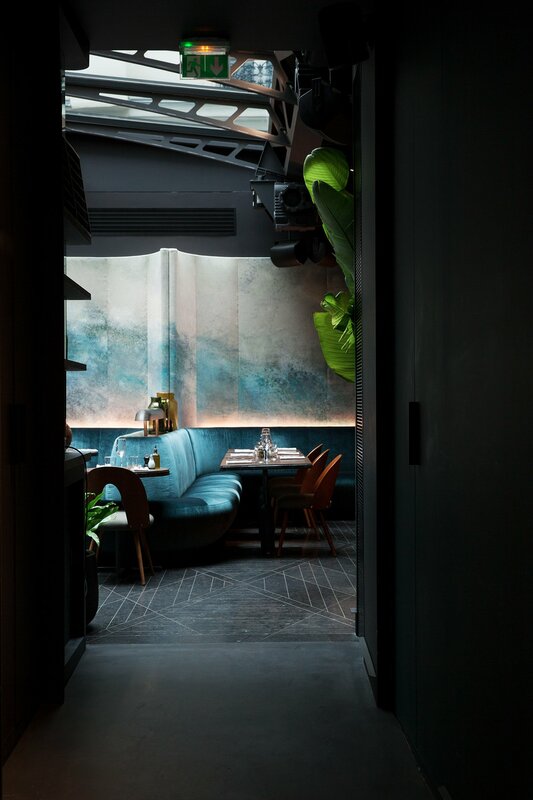 The space consists of a very cosy lounge (40 seats) and a terrace (50 seats) and is ideal for anyone who wants to take a break, meet up or get ready for the day ahead, before heading out into Paris. What is the concept of the l’Herbarium cocktail bar? As an extension to le Ristorante National, l’Herbarium provides fifteen seats at the counter and thirty seats in the adjacent lounge. But most importantly of all, this cocktail bar offers a menu created from scratch by Oscar Quagliarini. The talented head barman has created his own approach to drinks, which are mixed in the manner of a perfumer mixing fragrances. Each drink has a strong olfactory/gustatory identity, which is sometimes feminine, sometimes masculine, and which should awaken all the senses of whoever drinks it. ne of Samy's great qualities is to find the right people in their right momentum and to motivated them with great solidarity into one project. If you have to choose one: what it be the element you are the most proud of? The carved marble staircase that leads to the underground Galerie des Arts et Métiers is a very complex element that took a long while to realise. It is a repetition of curved linked massive marble that together create an organic staircase. I find staircases an occasion for a sculptural expression. whether going down or up the stairs, there is a very sensual and futuristic feel to this experience. This element, as well as the complex puzzle of the fossile granite floor, has been realised with Granits & Matériaux. Some anecdotes on this huge construction work? While browsing through different furniture galleries, I stumbled upon a beautiful Vintage Czechoslovakian Dining Chair by Antonín Šuman, I showed it to Samy and the day after we were standing in a tiny village next to Bratislava in Slovakia meeting two young collectors of furniture in their secret warehouse. Samy managed to get by the end of this month 107 different chairs. This type of adventure happens frequently while working with Samy, as he always digs through the system in order to get to the source. What is, in a few words, the spirit and the universe of the Hôtel National des Arts et Métiers? A mixed chronology, welcoming, generous, relaxing and crafty. A place which meets the expectations of our Parisian and international clients. A place, an ambiance and an atmosphere which make them want to come back. I find staircases an occasion for a sculptural expression. whether going down or up the stairs, there is a very sensual and futuristic feel to this experience.